It’s pink, it’s totally cute and ready for service! The super kawaii Hello Kitty Shinkansen by JR West. Which will run for a limited time on the Sanyo Shinkansen line, connecting Osaka to Fukuoka. 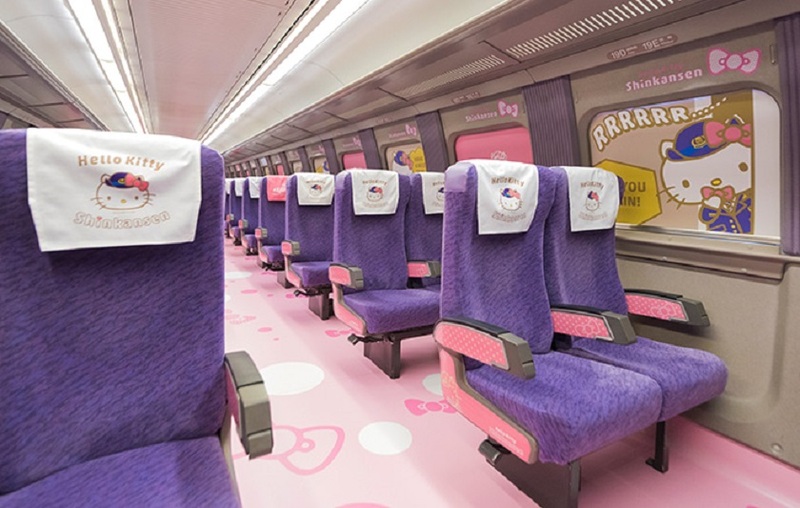 Sanrio’s popular cat character will decorate the outside in her adorable pink ribbon style, while the inside of the train has an two train carriages completely dedicated to interacting with Hello Kitty, even the train announcements have themed sounds! Can I use the Hello Kitty Shinkansen with the Japan Rail Pass? Yes, the best part of the train is that it is completely free with the JR Pass, including complementary seat reservations. The train runs a Kodama service between Shin-Osaka and Hakata (Fukuoka stations). The Kodama service is basically a Shinkansen that stops at every station. The train is very popular so be sure to reserve your seats in advance. It is also possible to buy a normal ticket for the Hello Kitty Shinkansen in case you do not have a JR Pass. This can be done at any JR Ticket Window. In addition to the Japan Rail Pass, there are also different regional passes by JR West that cover the Hello Kitty Shinkansen. However keep in mind that this will only be for the validity area of the pass. For instance the Sanyo-San’in Northern Kyushu Pass covers en entire route from Shin-Osaka to Hakata. However the JR Kansai – Hiroshima Pass would only cover the route as far as Hiroshima. For here you’d either have to buy a ticket for the remaining part to Hakata or leave the train, for a full list of JR West passes see here. The first two train cards have been changed into two Hello Kitty worlds. 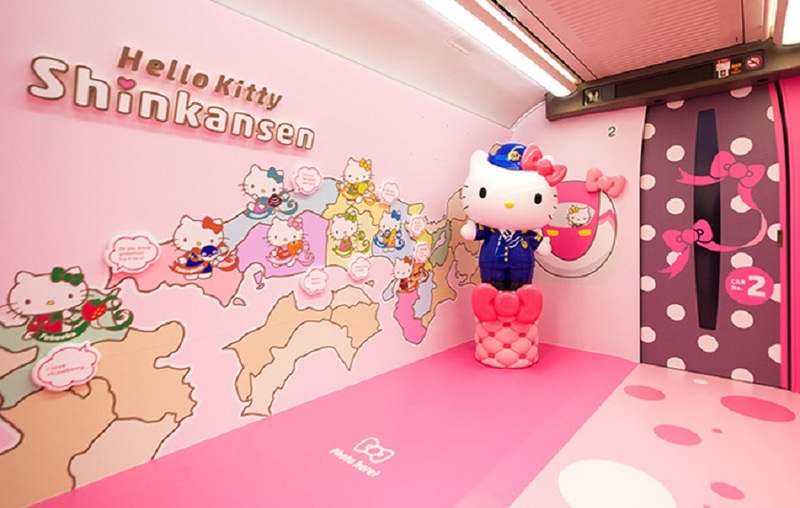 Train Car 1 is named Hello Kitty Plaza with a special souvenir store and cafe. There are 8 exclusive Hello Kitty design products on sale, each specific for 1 of the 8 regions that the train travel through. For instance, there’s a Strawberry Hello Kitty from Fukuoka and an Orange Hello Kitty from Tottori, symbolising their local products. The complete set of regions is Osaka, Hyogo, Okayama,Tottori, Hiroshima, Shimane, Yamaguchi and Fukuoka. Train Car 2 is called the “Kawaii Room” or super cute room. It is completely covered with motifs from Hello Kitty and her Friends. There’s also a photo stand where you can take a picture together with Kitty-chan, great for your Instagram cravings (be sure to tag us at #jrpass). The train is a complete restyled 500 Series Shinkansen with a 3×2 seat layout. Cars 3-8 have normal seats but even the interior of these carriages has completely been done in an overdose of cuteness, even the seats are pink and purple. Hello Kitty are on the head covers and window shades of the train with hidden kitty items all around the train. Other compartments of the train have not been spared either, the toilets and wash rooms have been completely restyled. There are no special Green Class (1st Class) seats but who cares when your train is already super plushy. Do you want some extra Kitty-chan? JR West opened a special Hello Kitty cafe at Hakata station. Enjoy a cute latte or even better Helly Kitty curry, featuring the character moulded in rice, complete with edible train attendant hat and pink bow and if you still haven’t had enough, finish your meal with a Hello Kitty Cream Daifuku Set or special rice pudding. The trains operates two services per day on most days (be sure the check the actual service in advance). The Kodama 730 (Hakata to Shin-Osaka) and Kodama 741 (Shin-Osaka to Hakata). Given the time-table, for most travellers getting on the train from Shin-Osaka to Hakata makes the most sense. If you have planned to visit Hiroshima in your visit to Japan, then this train is an easy connection. Trivia: Do you know what time name of Hello Kitties husband is? It’s the same as our travel expert on the forum. Feel free to ask us if you have any further question about the Hello Kitty Shinkansen or travel in Japan.